Too much of any one thing can throw life off balance, especially for seniors who need to manage regular changes in their physical, mental, and emotional wellbeing. Oakville, ON, home care experts discuss some of the main reasons maintaining balance is so crucial for promoting your aging loved one’s health. Aging adults need healthy meals, solid sleep schedules, regular exercise, a range of engaging activities, and plenty of social engagement. If your loved one is focusing too much time on just one of these things, something else may be getting overlooked. Ignoring essential forms of self-care or necessary household responsibilities is bound to have consequences. A balanced lifestyle ensures all basic needs are being met and areas in need of special attention can be duly addressed. With outside support, your loved one can maintain his or her independence without spending exorbitant amounts of time trying to get things done. Social relationships become increasingly difficult to maintain as people grow older. However, it is these connections that make people feel valued and content. Without social stimulation, your loved one may develop problems like chronic anxiety and chronic depression, but regular engagement with friends, family members, and Oakville, ON, caregivers can help him or her remain emotionally balanced. Most seniors are fiercely protective of their independence even when it is to their own detriment. However, many respond well to structure. Having a schedule gives them a sense of what to expect, which brings a sense of comfort. With clear, simple schedules and little to maintain, aging in place becomes far easier to manage. There are fewer tasks to remember, reasonable expectations, and just enough for them to do each day. Helping your loved one find the right resources and support can prevent him or her neglecting important responsibilities. 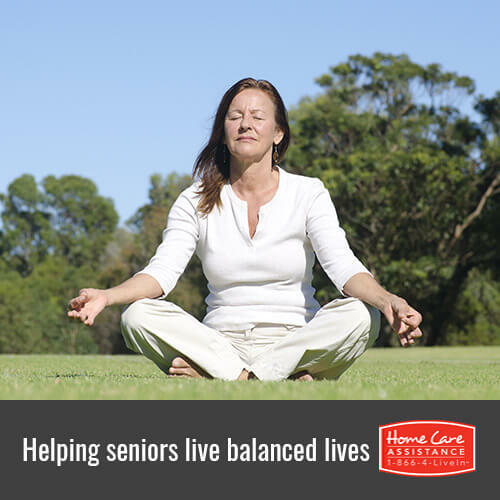 At Home Care Assistance, we believe taking a balanced approach to life is essential for seniors who want to remain happy and healthy. Our revolutionary Balanced Care Method, which is included free of charge with any of our in-home care plans, is designed to help seniors devote more time to healthy lifestyle factors like exercise, diet, social and mental stimulation, and calmness and purpose. We also offer specialized Parkinson’s, stroke, and Alzheimer’s care Oakville, ON, seniors can count on. For more information and to schedule a free in-home consultation, call (519) 590 2792 today.